Reading Death Carries a Camcorder is sort of like watching one of those lumberjack competitions. Except instead of just trying to cut through a log with a chainsaw as fast as he can, the lumberjack fires up his Stihl and slices out a perfect sculpture of Gandalf from an old stump in about two minutes flat. Who carves titles like that out of thin air? I wanted to read all of those before I even knew what they were about. You can just tell before you even see the covers (which are also quite nice). Death Carries a Camcorder is my most recent read from the set. It is a dazzling dissection of the state of traditional fantasy writing and publishing. Mr. Simon rightfully and skillfully skewers the likes of GRR Martin, Terry Goodkind, and Robert Jordan among others. Fantasy fans will truly appreciate Mr. Simon’s thoughts and analysis as he lays out his take on topics like: Violence to the Point of View, The Aggravated Trilogy, Archaic Language Abuse, Villainous Heroes, Missing Morality, and much more. Pithy, powerful, and perceptive, Mr. Simon’s essays are always truly great reads. 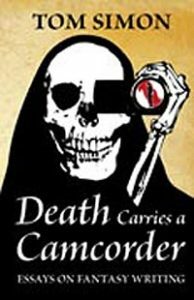 See Death Carries a Camcorder on Amazon. 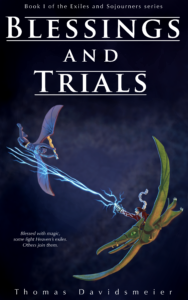 See Thomas Davidsmeier’s debut novel, Blessings and Trials, on Amazon.